« I’ll add a snowy Christmas-time post later today. 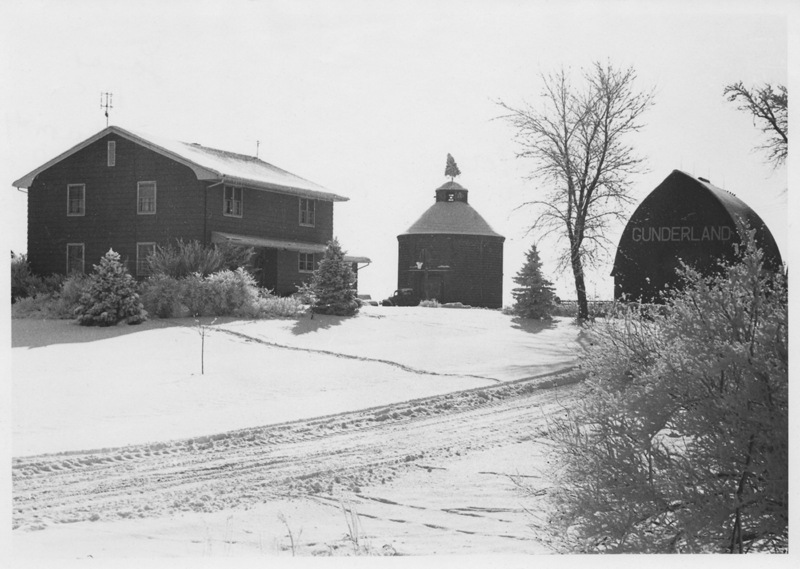 In the above photo the Christmas tree was on the dome of the brick corn crib at Gunderland, the farmstead where I was raised. 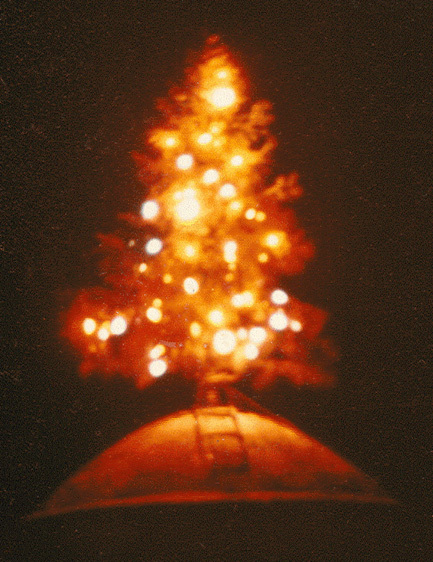 For several years in the 1970s, Daddy (Deane Gunderson) and Johnny Zeman collaborated to offer holiday spirit emanating from these glowing lights seen across the night-time countryside. Immediately below is a 1970s video* of their process. Daddy is the person at the beginning of the video carrying the tree up the ladder. He’s also the person getting on top of the dome of the crib, and the second person coming out of the top of the crib to climb down the ladder. Johnny is the person inside the top of the crib while Daddy is carrying the tree up. Johnny is also the first person to climb down the ladder at the end of the video. Marti (7-year-older sister of mine) is in the yellow coat. Mother is in the red scarf. Mick (Marti’s husband) is in the leather jacket. I’m not sure who the person is in the vicinity of the red barn. At the end of the video there are a few seconds of footage of my Dad’s “old” (the red one) and “new” (the sheet metal one) work shop. The old one was destroyed in the tornado that passed through in 2004. The new one still stands. Also in the video you’ll see our two dogs coming out of their warm doghouse. My dad made this doghouse by removing a basement window so there would be an opening for the doghouse “door.” Just inside that foundation opening he built a wood and glass doghouse that was at the ceiling level of the basement. Whenever we went down to the basement, we could look up and see Dumpty (my dog that Daddy gave to me when I graduated from eighth grade at D.M.T., hence the name “DuMpTy”) and Happy (Dumpty’s son) and they would wag their tails with excitement as they could see us. This entry was posted on December 24, 2010 at 1:55 pm and is filed under Deane Gunderson. You can follow any responses to this entry through the RSS 2.0 feed. You can skip to the end and leave a response. Pinging is currently not allowed. Hey! That was fun! I’ve seen the Christmas tree up there, but never seen it placed there. And I’ve never heard about the “doghouse” before, but it sounds unique. Thanks! What fun! And now I know what you meant by “I’m going somewhere with this” when I commented on your post about Johnny. The pictures and video are wonderful. A Christmas present–so to speak. Martha, Hal and I just enjoyed watching the video together. Funny….all these years I assumed Daddy carried the tree on his back as he climbed up INSIDE the crib. I’m glad to have that notion corrected. I hope Johnny enjoyed this yearly activity as much as Daddy did and as much as we all enjoyed the results of their efforts. Seeing the lighted tree on high as we approached from the west was always a nice WELCOME HOME sign. Thanks for posting this on Christmas Day! I love the video. It really captures the spirit of Christmas at Gunderland and of Daddy’s creativity. Thanks for sharing. Hope everyone who reads this is having a truly wonderful and joyous Chrisymas.